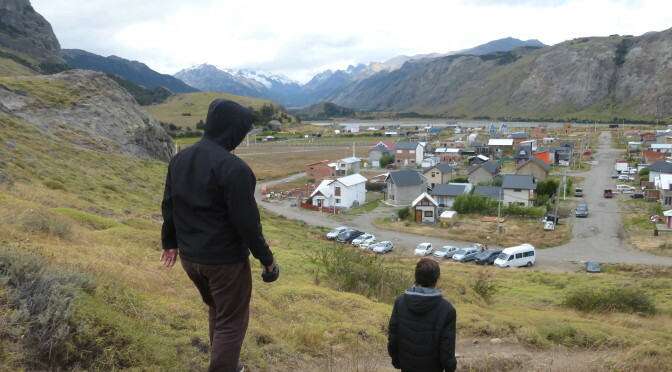 There are towns in the south of Argentina that I will remember forever. 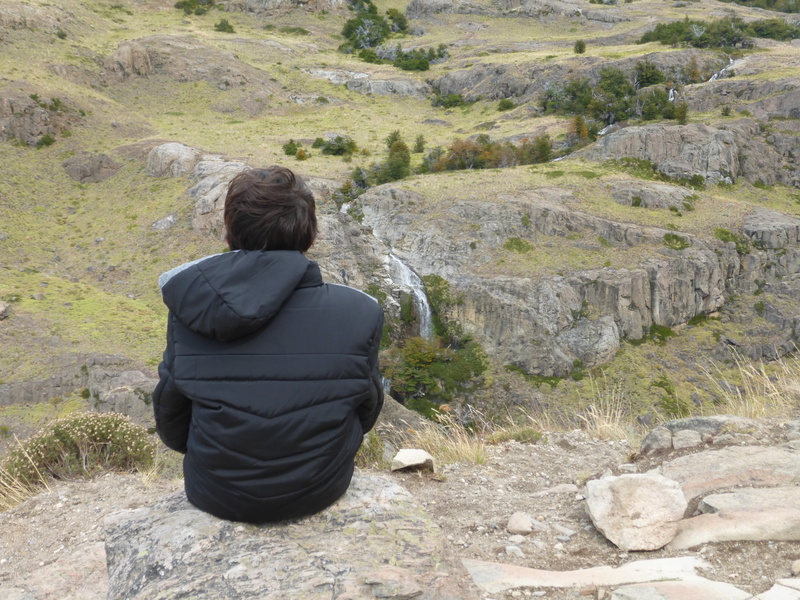 El Chalten is one. My family and I were growing tired of hauling our suitcases. (our house and lives were compacted in a suitcase) and also growing tired of long hours on a bus . 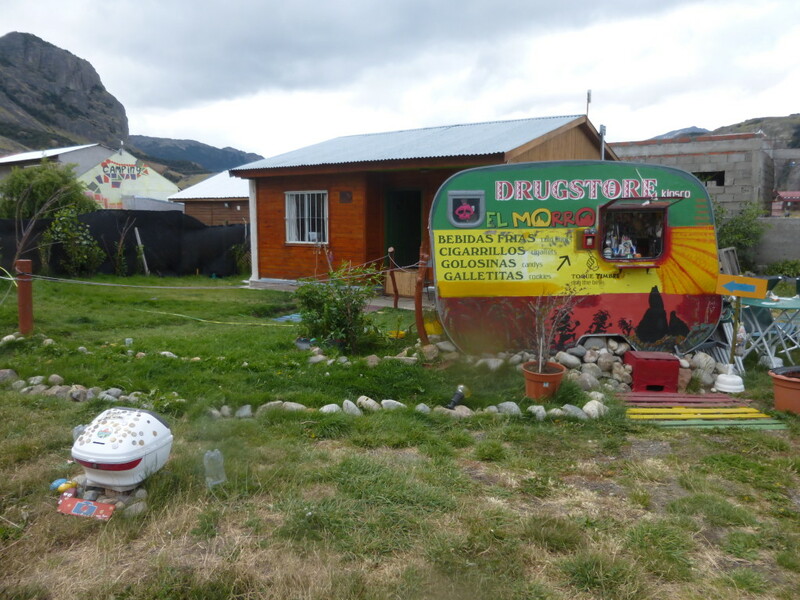 I expected nothing memorable from our stop in El Chalten and I was almost bothered by having another overnight to stop before our objective : trek in a Patagonian Glacier. El Chalten is known for their high winds , snow covered mountain vistas and more things I probably missed seeing .The winds are so strong that if you become distracted, it can easily blow you away. The unexpectedly fantastic view of the snow covered mountain peaks excited me, not necessarily for my desires but for my kids and, especially, my husband who has watched many documentaries on Patagonia showing it’s many outdoor activities, especially hiking, trekking and mountaineering. After a 12 hour, overnight bus ride from our previous town, in Los Antiguos, there is nothing worse than arriving at 7am to the destination, in the very early morning and hearing “your rooms are not ready, check in is at 12noon”. But this was our reality of more hours sitting to wait for the rooms. As we waited, we sat on bare wooden benches. 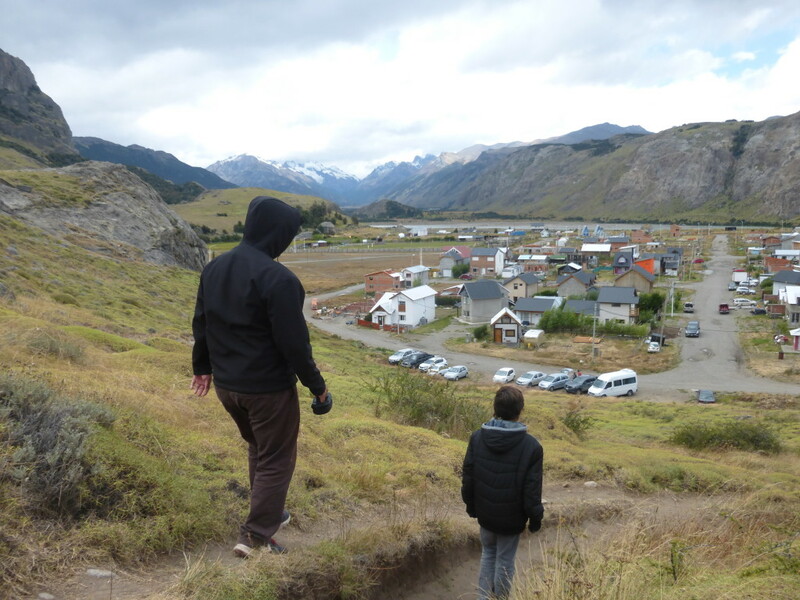 Anxiously, my husband and youngest boy were ready to explore the town and surrounding landscape. In contrast, my oldest son cared more for his WIFI connection so he could connect and make more music tunes for his soundcloud collection. For me, I didn’t even know what I desired more, bed ,shower or nothing at all, It had been a difficult day, fighting and holding on to my business and entrepreneurial mind is not an easy task. What I honestly wanted to do was to work, yes, I wanted to be working, i wanted the connectivity at all times as I am use to , this was heavily weighing on me. to not make money has been increasingly frustrating , and building up on me, But the only way to enjoy and experience moments with my family is to live in the moment , cant think of the past, or the future , without reverting back to my “should do list”. I realize that I must create memories and be a role model for my kids while educating myself and my family with values, and appreciate the many cultures which we have been experiencing. F8 journey IS happening now and I cannot be distracted from those core objectives and purpose. Of course, easier said than done! But one must take the bull by the horns and continue onward. and changing to the most warm clothes a Florida girl owns, we started a small trek that was weather proof available for all. This was a trek to wonderful waterfall, lake views and majestic mountain views. We began the walk and on the way to the trail, I smelled the most amazing homemade scents of lamb. “Cordero”, is announced on almost every corner. I started the trek knowing that this would be my price for finishing the trek. My discomfort during a trek can not be contained in my mind, but also must be verbalized. During my uncomfortable trek, in my mind, no view of a paradise in the world would have changed my mood. I huffed and puffed as we hiked the 3 miles of climbs and descents. As we passed over a climb, to my surprise, a view of waterfalls and the glacier were extraordinary. I struggled but actually enjoy it. Photos can only partially describe the magnificent views. Not only magnificence from what my eyes were experiencing, but also an epiphany. The route I walked , huffing and puffing for 3 miles. Hungry and thirsty we started the return with everyone laughing at my complaints for how difficult was the decent which is typically easier than the ascent. My toes hurt , my knees hurt, my kidneys, other body parts were in pain. We made it back to town and with it being 4pm in this land, it is sac religious to ask for food at this hour. This is the break time when the town’s people take a break from serving tourists. This is the time for themselves to play their music and eat their foods. While I knew and appreciated this ritual, I had an obsession with the thoughts of my prized Lamb dish. We detoured from our return to the hotel and entered a restaurant where I thought we would get the “authentic” experience of Cordero Asado and cure my craving. 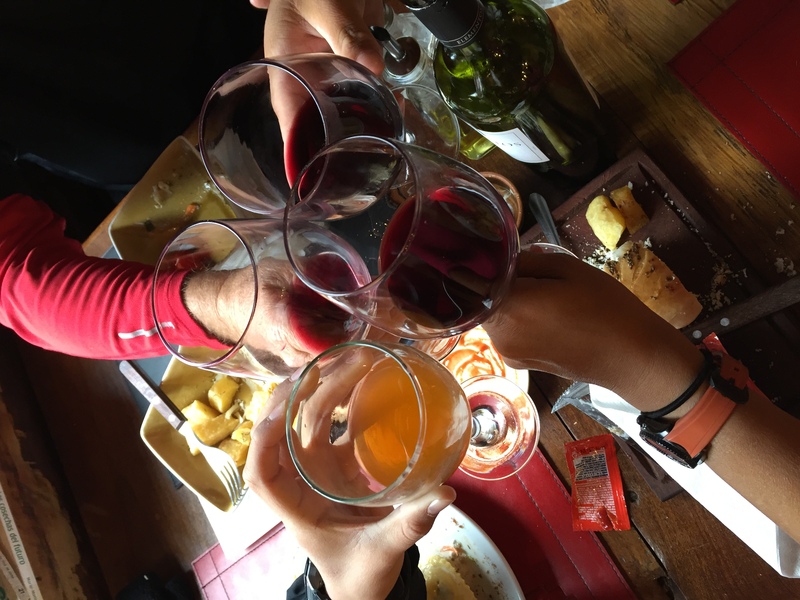 It was a chance to be among locals and help dissipate my feeling of inadequacy in my business by doing something I truly love: to drink wine and have a nice profound conversation with the locals. We ended up in a place that was filled with Che Guevara’s and other’s quotes and the Mapuche’s culture photos and flags and book titles that have revolutionary tones. This would be a perfect place to cheer me up. I was overjoyed when the owner/attendant agreed to serve us and that they could served the Cordero Asado for which I craved. I chose to stay, against my son’s protests. His idea was to just mingle with the mainstream and eat at the restaurant within our hotel. I loved experiencing the Bohemian lifestyle while treated to a few of the local musicians sitting around practicing their music. I cherish the nice, long talk with the restaurant owner. 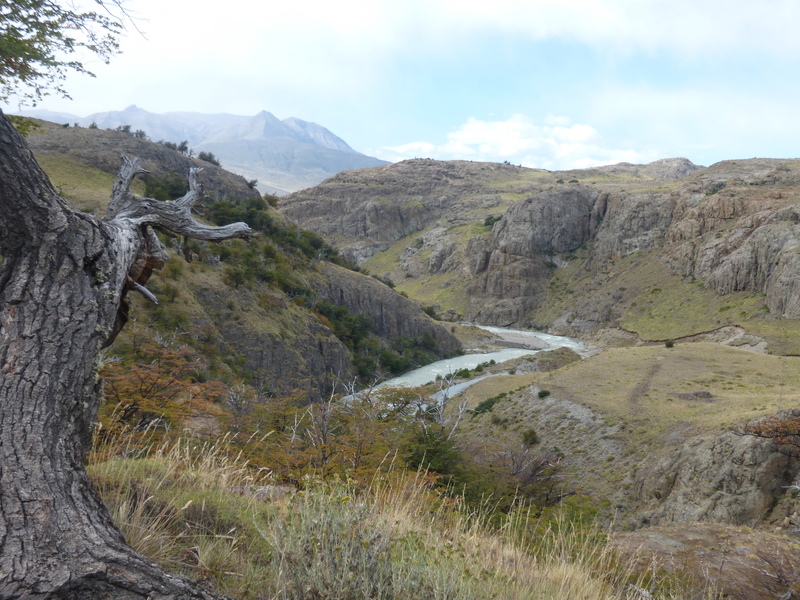 We talked history and learned more about the Mapuche’s and Tehuelches , native roots in Patagonia. This interest had been sparked and had become a favorite subject during my earlier conversations with another restauranteur, Mario from the restaurant ‘Don Raul’ in San Pedro de Atacama (Chile). This latest conversation regarding the Mapuche culture made me remember and appreciate my admiration for their culture. Mario explained how the Mapuche people were the strongest fighters defending themselves against not only the Spanish conquistadores but the mighty Inca attempts to conquer. This is an interesting subject that I plan to continue to research. 2) unfortunately, it may be an remembered for the worst meal we had in Argentina . and the priciest we pay in Patagonia. I have been lucky enough to taste gastronomy in many continents and I feel spoiled when it comes to the tastes I have experienced, but having my kids, who pretty much eat anything, telling me that this food was horrible was crushing. My lamb and kids pasta where incredibly bad. Thankfully it was difficult to fail my husband’s salad. But, I couldn’t believe this would end up being the worse meal ever, as far as taste is concerned. I am disappointed and i was banging my head on the wall for insisting on this restaurant because I saw so much potential, but, instead I will choose to be thankful for the laughs and for the learning from the locals that keep the flame of recovering their native lands and roots. I am thankful for the laughs of my kids even if is to make fun of all my aches from trekking and thankful to this meal, for distracting me instead of my thoughts being upset. Let me say that the stress of not being able to work and create business ideas , 24/7 as I am use to, had not being “cured” and stills haunts me since the first week of our trip. But I am making the efforts to place them aside an living the moment, I am enjoying my family, and trying to smell all the roses in our journey. I want to point out something that I mention to my travelers when I plan their trips, no matter your destination, your state of mind will always determine how much you enjoy it. In the journey and the destination, your emotional state will allow you to experience the world at its best – good or bad. 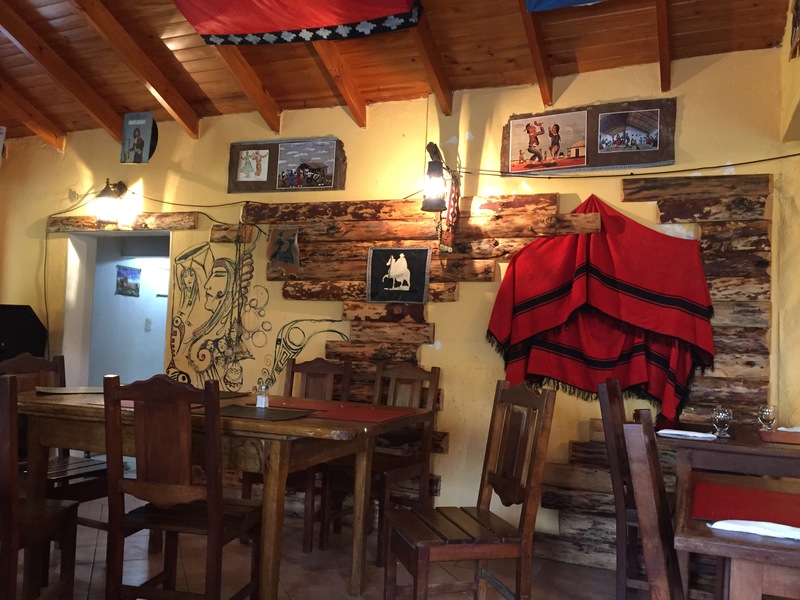 I pretty much spoiled my trek, but chose to change my state, I would like to point out that I would love to come back to El Chalten with more days than just an overnight. This is a beautiful town where Nature lovers of all countries and all ages come for the pristine looks of hills, lands and Glaciers. Perhaps not like me, expecting too much for the “Cordero Asado”! Views of my boys , enjoying a walk. How long a 12 year old will keep this memories ? hopefully forever. Notice waterfall on the right. Sealing our unforgettable and no ordinary lunch with our cheering toast .